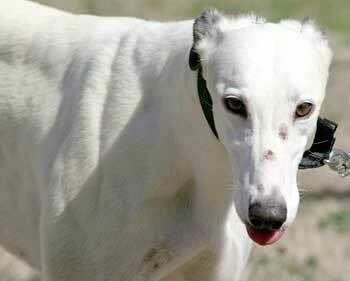 Fly, aka WKD Fly Levell, is a beautiful 2½-year-old white and dark brindle female, born August 7, 2004. Her sire is Naughty Waltz, making her grand sire Molotov, and her dam is CJ Devon, making her grand sire the late Gable Dodge...what a lineage! 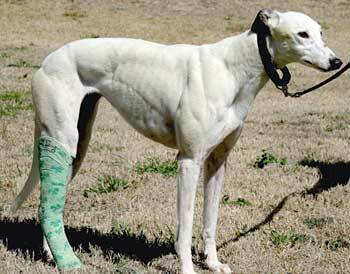 Fly's racing career consisted of 43 races, starting at Southland in West Memphis, Arkansas on April 1, 2006, and ending February 9, 2007, at Valley Race Park in Harlingen with a fractured hock. Fly, along with Tucker, Solomon and Sue Bee, was flown from VRP to Addison Airport by GALT volunteers and adopters Jane and Michael Scott on February 26. After evaluation by Dr. Jeff Ellis at VCA Preston Park Animal Hospital, Fly was referred to Dr. Bob Radasch of the Surgery Center. Fly's central tarsal bone was fractured, and because she had been put in a splint right after the injury, the fracture was pretty much cemented and mended. 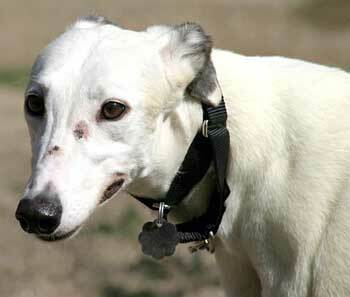 Dr. Radash expects Fly's injury will not hinder her quality of life as a companion pet.